The ease of use, the simplistic website for everyone in the office to use, the good reporting and charts we can use for board meetings, we love it all! Our organization has been using Constant Contact for over 5 years, and we have enjoyed every minute of it! From the ease of use to the simplicity of the website and sending emails, we have had much growth with Constant Contact! If you are a nonprofit organization looking for an easy and affordable tool in sending bulk and blast emails, take a demo of Constant Contact! The ease of use, the simplistic website for everyone in the office to use, the good reporting and charts we can use for board meetings, we love it all! Our organization has been using Constant Contact for over 5 years, and we have enjoyed every minute of it! From the ease of use to the simplicity of the website and sending emails, we have had much growth with Constant Contact! If you are a nonprofit organization looking for an easy and affordable tool in sending bulk and blast emails, take a demo of Constant Contact! That customers can be in multiple lists and we don’t have to worry because they still receive only 1 email. Cons: The non-search feature Love it! Wish it had a search feature and some other basic features as the company all shares access to it and it’s hard to track down what other people sent in previous years. That customers can be in multiple lists and we don’t have to worry because they still receive only 1 email. Love it! Wish it had a search feature and some other basic features as the company all shares access to it and it’s hard to track down what other people sent in previous years. Great customer service. Whenever we encountered problems with data uploads/downloads or other situations, the phone support was quick to answer and very knowledgeable. Inexpensive for the quality of email platform. Great for small businesses. Not catered towards mid to large organizations selling multiple products and services. Unable to created multiple lists for product or services with the option for recipients to unsubscribe from just the one list (unsubscribes from all). Overall the Constant Contact tools are easy to use and very professional. We are a mid-sized financial institution that sends around 14 to 28 thousand emails per week. When I came into my role we had been using Constant Contact for a number of years. However, I felt that we had outgrown its capabilities. The platform is primarily for small businesses and some of the features were lacking for what we needed. Specifically, the ability to create separate subscription lists. That said, the customer service is amazing and if you live/work in the Boston area then there are always training seminars going on. As a financial institution, it is worth paying more for an email marketing platform that integrates with your core or at least that is customized for the industry. Great customer service. Whenever we encountered problems with data uploads/downloads or other situations, the phone support was quick to answer and very knowledgeable. Inexpensive for the quality of email platform. Great for small businesses. Not catered towards mid to large organizations selling multiple products and services. Unable to created multiple lists for product or services with the option for recipients to unsubscribe from just the one list (unsubscribes from all). Overall the Constant Contact tools are easy to use and very professional. We are a mid-sized financial institution that sends around 14 to 28 thousand emails per week. When I came into my role we had been using Constant Contact for a number of years. However, I felt that we had outgrown its capabilities. The platform is primarily for small businesses and some of the features were lacking for what we needed. Specifically, the ability to create separate subscription lists. That said, the customer service is amazing and if you live/work in the Boston area then there are always training seminars going on. As a financial institution, it is worth paying more for an email marketing platform that integrates with your core or at least that is customized for the industry. I really enjoy that we can store and organize many different lists of emails in many different groups. This makes contacting our members easy. We can update a large group of people quickly. Constant Contact has helped us keep up with multiple emailing lists and made it a breeze to contact those people in just minutes. We use it with sending out updates, prayer lists, devotionals, and more. I would say to definitely try out this software if you are looking for a way to stay in contact with different groups of people, whether they are in large or little quantities. I really enjoy that we can store and organize many different lists of emails in many different groups. This makes contacting our members easy. We can update a large group of people quickly. Constant Contact has helped us keep up with multiple emailing lists and made it a breeze to contact those people in just minutes. We use it with sending out updates, prayer lists, devotionals, and more. I would say to definitely try out this software if you are looking for a way to stay in contact with different groups of people, whether they are in large or little quantities. Easy to learn, has many usable report features, efficient With the latest updates, it doesn’t appear there is customer support through Live Chat. I have had to call for help and hold for an unreasonable amount of time. We use Constant Contact for all of our communication to school families. 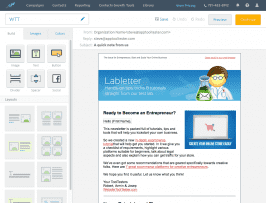 The emails are easy to create with many choices of templates and they all look professional. The reports available make our job easier and help us continuously improve our communication. We know who receives emails, who opens them and when, what links are shared, etc. The software is easy to learn and it takes no time to become a pro using it! Maybe best of all, it is very affordable! Encourage your stakeholders to “self-manage” their emails. Get them off to the right start by teaching them to add and delete emails on their own. With the latest updates, it doesn’t appear there is customer support through Live Chat. I have had to call for help and hold for an unreasonable amount of time. We use Constant Contact for all of our communication to school families. The emails are easy to create with many choices of templates and they all look professional. The reports available make our job easier and help us continuously improve our communication. We know who receives emails, who opens them and when, what links are shared, etc. The software is easy to learn and it takes no time to become a pro using it! Maybe best of all, it is very affordable! Encourage your stakeholders to “self-manage” their emails. Get them off to the right start by teaching them to add and delete emails on their own. Constant Contact was founded as “Roving Software” in 1995. 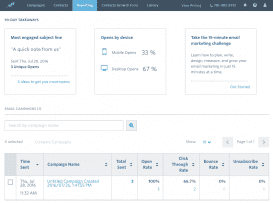 Their founders saw email as “a valuable marketing tool that would help small businesses level the playing field in the battle against big business.” In 2014, they released a powerful new interface designed to be the all-in-one marketing solution. 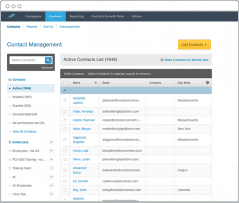 In 2016, Constant Contact was acquired by Endurance International Group. Constant contact emphasizes small businesses as their intended customers. Yes, for the first 60 days. No, but sign up is free. Email Automation: Set up an email series for similar customers – like contacts in the same area, or who attended an event. 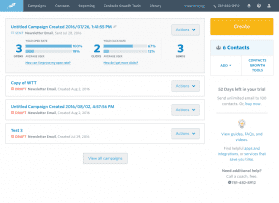 With email automation, when you send targeted messages, your relationships and results improve. Event Marketing: Packed events are good for growing businesses. But juggling the details in Excel takes up a lot of precious time. Everything you need to plan and manage your upcoming seminar, fundraiser, or party can now be done in one account. Online Donations: Your business’ donors can easily view your page—and more importantly, donate—while they’re on the go. Promote your fundraiser with Constant Contact’s email and social media tools. Surveys & Polls: Start with their pre-written questions and tweak them, or craft your own. Choose from seven types of survey questions — from multiple choice to sliding scales. View individual results, or track trends. You’ll get real-time insight into what people really want so your business can plan what to do next. Coupons: In less than ten minutes, you can create a coupon, add your business’ logo and branding, and hit send. Constant Contact helps you track everything: new email addresses, coupons claimed, redemptions and who shares the coupon on social media. Constant Contact is an all-in-one marketing solution who focuses on making small businesses succeed. They started out as a small company who understood the power of email and how it could help small businesses compete with much larger ones. Their pricing plans reflect their desire to help small businesses by offering tons of features while keeping prices low. What makes Constant Contact stand out from other marketing solutions are the seminars and training sessions with marketing professionals they offer either online or in person. Constant Contact offers a wide range of features small businesses can use to compete with other businesses. They both offer unlimited emails, contact management, apps and integrations, a mobile app, customizable templates, and many more. 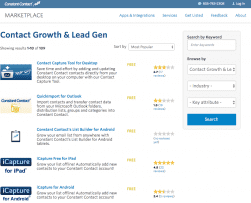 Constant Contact offers the best of sales CRM software, and email marketing software, like MailChimp, which makes them a versatile option to consider. Constant Contact’s pricing plans also reflect their goal of helping small businesses by remaining low and offering almost the same amount of features in each plan. They start at $20 and $45, and they offer discounts if your business chooses to do either a six-month or twelve-month prepaid plan. From there, depending on your business’ list size, the plans go up in price, but not too steeply. What makes Constant Contact stand out the most are the seminars and training sessions they offer customers. Customers can sign up for either online or in-person seminars where marketing professionals will work with you personally to ensure you get the most of their services. Their desire to maintain a strong connection with the community should tell you that they are actually looking to help you. Overall, Constant Contact is a great, versatile marketing solution small businesses should strongly consider. Their features are not revolutionary and can be found in other marketing solutions; however, Constant Contact goes the extra mile by offering online and in-person seminars and training sessions to their customers so they feel confident about using this all-in-one marketing solution to its fullest potential. Their prices are cheap and can be tailored to fit your business’ needs. What Do You Think of Constant Contact?